Members of the #Resistance itching for a high-profile takedown of our commander in cheat, Donald Drumpf, AND a reunion of the best show ever got an early Christmas present today: The cast of The West Wing reunited in actor Richard Schiff’s garage last night to say the phrase “Resist Trump” back and forth to each other without filming it. Hell yeah. You’re going to want to keep an eye on the orange buffoon these next few days. This is bound to throw that flaming sack of dogshit into a tailspin! After most of the legendary cast of The West Wing had assembled in Schiff’s two-car garage at 7 p.m. Wednesday, Schiff flicked the lights to get everyone’s attention before saying what is sure to be the rallying cry of the era: “Resist Trump.” If Drumpf is under the impression that he has cowed the American people with his tyranny, he is sadly mistaken, because it didn’t take long after Schiff had said “Resist Trump” for Bradley Whitford, known for playing fan-favorite Josh Lyman, to stand up and answer, “Resist Trump,” at which point Schiff turned to Whitford and said, “Resist Trump,” again. That would have been cool enough, but then Allison Janney (OMG Allison Janney!!!) reportedly said, “Resist Trump,” from the cooler she was sitting on, and then everyone was off to the races saying “Resist Trump” to one another in a devastating act of unity (and total #squadgoals!) that showed President Tiny Hands that the #Resistance will not go silently into the night, even if none of these liberal heroes thought to film this incredible moment. But even after saying “Resist Trump” to each other for three amazing, unrecorded hours in Schiff’s garage, the best was still yet to come. At around 10:15 p.m., the garage door slowly opened, and there stood President Bartlet himself, Martin Sheen, who looked around at his former castmates, cleared his throat, and said, “Resist Trump,” causing everyone to echo the sentiment for another two hours. 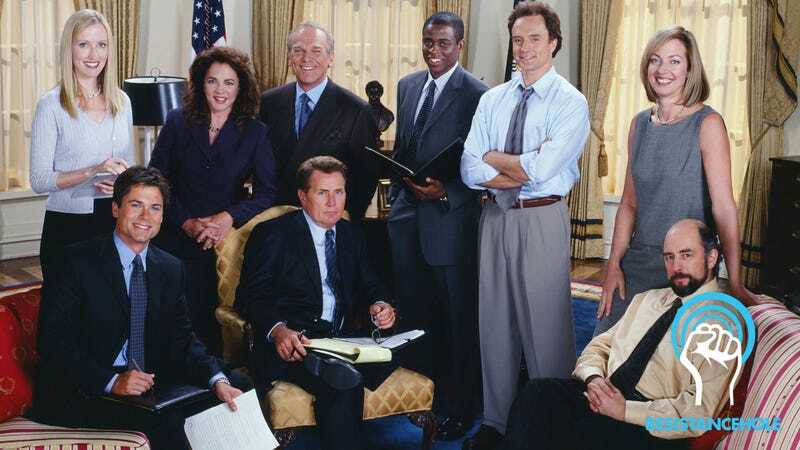 Um, can we get President Jed Bartlet in the Oval Office, like, right now? We can only imagine how viral this video would have gone had even one of the stars taken their phone out to record even a few seconds of this amazing display of #Resistance, but the mere fact that it happened at all has to have Trump and his lackeys quaking in fear. Yeah, we wouldn’t be surprised if President Dump, usurper of the free world, decides to cower away in his Mar-a-Lago hidey-hole after this openly defiant act. And to the actors of The West Wing who put themselves on the line and took part in this powerful event that no one will ever see or hear, we salute you.